I'd always say, when it rains it pours...and I'M LOVIN IT! After resting my overworked digestive system from the fun food blogger's meet two weeks ago, I got a new invite (my 2nd one!!) to attend the grand launch of Fely J's Kitchen at Greenbelt 5 last week. We all know about the LJC group and most especially on the late Larry Cruz who was highly regarded as a significant icon in the food and beverage world. Growing up, I've heard of Cafe Adriatico from my aunts and uncles, who would drive all the way to Malate for dinner and some drinks with friends. Then there's Cafe Havana, Bollywood and just recently, Abe. The list goes on but one thing stays constant -- it's the good quality of food that one can always expect from the LJC line of restaurants. Abe was named after Larry's father, E. Aguilar Cruz and the restaurant specializes in home cooked Kapampangan favorites like Gulay Magalang, Mutton Adobo with Popped Garlic, Abe's Chicken Supreme and a whole lot more. Abe was well appreciated by the upper AB dining crowd that it just makes perfect sense for the LJC Group to introduce a new restaurant concept this time paying tribute to Mrs. Felicidad de Jesus-Cruz, the woman who gave so much inspiration and motivation to the two men in her life -- Abe and Larry Cruz. The interiors of Fely J's remind me of a traditional Filipino home with a feminine touch complete with intricate floral designs and light pink painted walls. Each table has a big orchid centerpiece which I truly love! Surveying the buffet spread that the kitchen team has prepared for this special occasion, I see a fusion of Asian and Filipino dishes such as the: Vietnamese Fresh Spring Roll (P225) and Fresh Lumpia Ubod for starters, the Thai Shrimp and Pomelo Salad (P245), Namit Nangka sa Gata (P245) and the Nippon Surprise (P275) for the salad offerings, there's the Tilapia with Sweet Plum Sauce (P385), Ginataang Gulay at Hipon (P245) and the Lamb Kaldereta (P395) for their main dishes, and lastly, do not ever miss out on the Dilis Rice and the Char Kuey Teow (P395) to accompany the yummy main course dishes. Of course, a meal will never be complete without a sweet ending. They offered a platter of Fresh Fruits and my new found favorite -- the Maja Blanca. The two starters were pretty so-so simply because both lack the ZING! that I was looking for especially in the Vietnamese Spring Roll. However, an accompaniment of a tasty peanut sauce might just do the trick. The salads on the other hand will be one of the reasons why I'll definitely go back to Fely J's. I love how they mix local ingredients but giving the dish a unique identity. 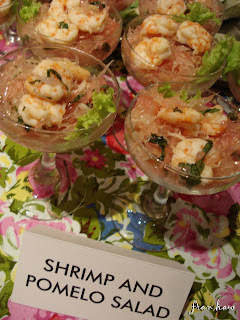 The Thai Shrimp and Pomelo salad, for instance, is a blend of pomelo and shrimps with peanuts and mint served on a cute cocktail glass. Thank God I was not disappointed as both dishes successfully passed the taste test with flying colors! The Lamb Kaldereta reminds me of Abe's Lamb Adobo which I will always go back for. It's perfectly cook just how a lamb meat should be. Stewed with onions, olives and other herbs, this dish is just bursting with flavor that will make you skip your carbo-diet for one night as you reach out for your second (or make that, third) serving of rice. The Ginaatang Gulay at Hipon has sauteed shrimps and veggies with coconut cream and spices. It's your feel good Filipino food that Mom would always prepare after a long day at work. What I enjoyed most about trying out new restaurants is when I see the creativity of the chef in creating a new yet very familiar dish. It's an interplay between going with the well-loved but giving it a new twist to make it more refreshing for the palate. One example is the Dilis Rice. Prior to this visit, I've been reading and hearing tons of raves about the rice. Friends would even tell me to "be sure to order the dilis rice!". Thank you my lucky stars as this was served during the launch giving me the chance to try it out myself. Looking at it closely, its actually piping hot steamed rice with garlic dilis on top. Hmm.."nothing that spectacular from the looks of it", from the looks of it. It wasn't until I ate this with my Lamb Kaldereta that I was able to fully appreciate this creative specialty. The dilis gives off a salty, garlicky taste to the plain rice which perfect complements any flavourful dish. It's actually like garlic rice with a twist. I absolutely love it! Making sure we save space for dessert, Cel and I found ourselves back at the buffet table right after our dinner plates were cleared. With a wide spread of colorful fruits and native delicacies, I settled for the Maja Blanca, since I'm a fan of kakanin (glutinous rice desserts), and a piece of Banana-Langka Turon. 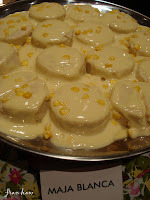 The latter was yet another ordinary offering while the Maja Blanca was really good! It has just the right amount of sweetness, creaminess and stickiness that, in fact, makes it very addicting. It was a pleasant evening getting to know more about Fely J's and what it has to offer. It's a perfect place for families who are looking for good ol' home cooking with a creative twist. Price ranges from P200 to P395 therefore it's wise to prepare at least P400 per head. Fely J's Kitchen is here to treat us with a different twist in Filipino and Asian cooking. It veers away from the traditional native dishes and instead adds a motherly touch to each dish. Following the words of a famous soldier who landed in Leyte..."I shall return!" 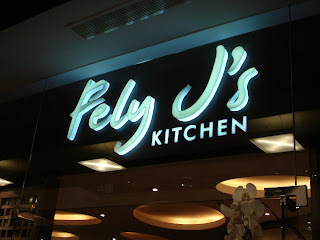 Fely J's Kitchen is located at the 2nd level of Greenbelt 5. You may call them at 7288878 to reserve. That Maja Blanca looks sooo yummy! I miss good Filipino food! so come and visit me na!! :) i miss u sands! !